On Thursday, Jan. 24, members of the Strategic Planning Group (SPG) and the Campus Sustainability Committee (CSC) presented posters to students in the Wilson Governance Room regarding six different themes: Relationships, Connection & Community, Student Engagement & Involvement, Comprehensive Advising & Mentoring, Student Support & Well-Being, Applied & Experiential Learning and Sustainability. According to the Strategic Planning & Priorities Advisory Committee’s (SPAAC) College wiki page, “[the] SPG is the President-appointed group tasked with advising the President on the College’s strategic plan” and is made up of faculty, students and administration. The members of SPG are divided into five different working groups and each focus on a different theme. In collaboration with CSC, which was responsible for its respective theme, the poster session allowed students to see the progress of the Group in the six different areas of study and listen to members discuss their findings. Fein also discussed the potential for a “Woo Welcome Week,” an off-campus team-building experience for first-year students, and a sophomore experience that would focus on leadership, advising and career planning. Emily Stoehr ’20 is a member of the Student Engagement & Inclusion group which focused on how the College could be a more fun and engaged social environment. She noted that there are many things getting in the way of this goal. “Some of the challenges that [prevent] this from happening on campus are students being over-programmed with multiple events, meetings or classes happening on the same day,” Stoehr stated. She explained that students will often choose a meeting that they are heavily involved in rather than going to an event of a new group. This creates a paradox because up-and-coming groups are in need of involvement, but students that would have attended cannot due to being over-programmed. The proposed solution would involve making it easier to do things spontaneously, introducing a “social mentor” to first-year students and focusing on the quality of events versus the quantity. 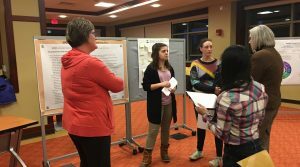 “We hope all of [our ideas] will culminate in a really involved and excited campus to do a wide variety of things instead of a select few students being super involved,” Stoehr said. The Comprehensive Advising & Mentoring group asked what successes the College has had in advising and how can the isolated nature between advising and mentorship be improved without increasing time commitment. They had the idea to make advising central to the faculty workload — discussing it during the hiring process, considering it in faculty reviews and giving 1.5 teaching credits for first-year seminar (FYS). The goals for the Student Support and Well-Being group include defining support and well-being as a campus-wide philosophy, providing a holistic approach to student support and involving all members of the campus community in the creation of resources that everyone can access. Stachal Harris ’21, a member of the group and the Campus Council (CC) representative on SPG, spoke about what areas have captured her attention. “I have really been trying to focus on are the resources that we already have here on campus and finding a way to put them in one spot where students know where they are [instead of saying] that the school doesn’t have them. The school just isn’t promoting them really well,” she said. The Applied & Experiential Learning (EL) working group has explored the best ways to market the current EL opportunities and how the campus culture can better revolve around EL. According to their research, EL is already a strong focus at the College because of Independent Study (I.S.) and APEX Fellowships. Other universities use various key phrases, EL centers for faculty development and intentional advising to better market their own EL programs. To help move forward, the group proposed that the College could “reimagine marketing to align with the expectations of the public.” Focusing on the language of internships, for example, could make Wooster more attractive to students and is more specific than “experiential learning.” Additionally, promoting EL in coursework and allowing each department to establish one EL initiative or course would help students become more well-rounded without the same rigor as I.S. Laying out the steps for student development over their four years through intentional advising or “campus communities” made up of faculty, staff and peers could help place less of a stressful burden on the students alone. Currently, CSC is drafting a job description, but this will take a lot of research since the group is working with a “blank slate.” Tarburton added that other schools that are similar to Wooster have a sustainability coordinator. In addition to the proposed new position, the five-year plan will also outline the need to reduce the College’s carbon dioxide emissions and overall waste. “We also have a handful of sub-committees that are made up of people outside of [CSC] that any student can join and are focused specifically on energy, education, food, waste and recycling,” Tarburton mentioned. All of the SPG groups encouraged students to provide feedback on their ideas to see if they are headed in the right direction. Students can reach out to any members of the SPG groups, Professor Tom Tierney, chair of SPAAC, or Chief Information and Planning Officer Ellen Falduto, vice chair of SPAAC. wnature of international student orientation could be an area for improvement, as well. While it aims to equip new international students with the knowledge and resources they need as quickly as possible upon arriving on campus, it may not be sustained enough to be fostering their well-being and social connection after that initial few weeks. Chingonzo and Khan agreed that programs such as IPP or the Global Engagement Seminar had been very positive elements of their experiences and that such initiatives should be more widely promoted to international and domestic students alike. There’s a lot of pressure on international students to just assimilate within the college evvironment and American society without actually recognizing the cultural differences in place. It shouldn’t just be on the international students to assimilate, it should also be that the host environment is a place that understands those. Cultural competency and awareness of microaggressions play a major in the work that lies ahead for Wooster’s domestic students as well.